Here is a Lobster Salad Roll recipe that will delight your guests and start the summer off right. 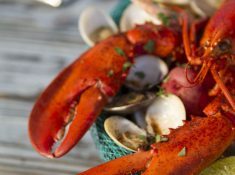 Remove the meat from the lobsters, chopping any large chunks into bite-size pieces. In a bowl, combine the lobster meat, mayonnaise, lemon juice, celery, parsley, and salt and pepper to taste. Cook’s Note: Place lobster salad in refrigerator for 5 to 10 minutes. This allows the salad to absorb the flavorings. Brush cut sides of the rolls with melted butter and fill with the lobster salad.